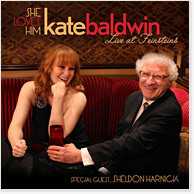 In the first solo disc devoted entirely to Broadway legend Sheldon Harnick’s lyrics and music, Kate Baldwin mines the master’s witty, moving and funny songs to astonishing effect in SHE LOVES HIM (Live at Feinstein's). A 2010 Tony Award-nominee for her starring role in Finian’s Rainbow, Baldwin performs favorites from Harnick’s biggest hits, Fiddler on the Roof, She Loves Me and Fiorello!, as well as rarely-heard selections from his early Off-Broadway career, film scores and unproduced musicals. Recorded live in March 2011 at New York’s Feinstein’s at Loews Regency and produced by Grammy Award-winner David Frost, the disc – with music director Scott Cady at the piano, Andrew Sterman on woodwinds and John Beale on bass – includes a special appearance by Harnick himself, who joins Baldwin on several selections. The New York Times has raved, “Magic occurs whenever Ms. Baldwin has a chance to sing,” and Harnick echoes, “I love Kate's voice and the intelligence that shapes her performances, so you can imagine how delighted I was when she told me that she wanted to do a program of my songs.” Now, this delightful set of standards and stand-outs has been preserved for fans of Baldwin, Harnick and the Great American Songbook. "My favorite Sheldon Harnick show..."
"Be kind to this Irish girl..."
"Jerry Block and I wrote a song..."
"Cy Coleman and I had a meeting..."
"He drew from very personal images..."
"It's time to start saying goodnight..."